James Roy Cook, Sr. was born in Seville, Florida on August 23, 1953, to Roy S. and Rosa E. (Willis) Cook. He was their third oldest and first-born son. On his birthday in 1977, he married Belinda Fulton, and to their union, they went on to have daughters, Cantrell Meshawn (Candy), Nakeisha Terrelle, and James Roy, Jr. They made Newburgh, NY their home until 1995, when he decided to move the family to Sarasota, Florida, where he resided until his passing on Tuesday, March 26, 2019. At an early age, he along with his siblings had been instilled with a strong work ethic, be it working in the fields or groves in Florida, or in the orchards in New York. This work ethic would carry on, from his studious accomplishments in high school-he was co-valedictorian for the Class of 1971 at T. Dewitt Taylor High School in Pierson, FL; honorable discharge from the US Army while serving in the 1970s; and the careers he held at West Point Academy, IBM, and finally Tri-County Air Conditioning and Heating, where he went back in the classroom and obtained his certification in a/c and refrigeration. He would often tell the story of how he had been ordained at an early age while living in Modena, NY. His thirst for knowledge of the bible led him to attend several bible schools, and theology courses. He loved the word, the word was with him, and he enjoyed sharing the gospel with any and everyone he encountered. In the early 1990s in Newburgh, he delivered his first trial sermon, while attending Holy Trinity Church of Unity and obtaining his certificate of ordination to minister. From then on, he preached the gospel whenever he was invited (New York, Florida, and Georgia). He would proclaim that he was just a messenger from God, or as he would say, “the Holy Ghost mailman”. It was evident in the number of people who were impacted by their interactions with him. Aside from singing, James enjoyed throughout his life traveling up and down the highways spending time with family and close friends, fishing, cooking, carpentry and building, sketching, swimming, football, working with his hands trying to fix any and everything electronic, and numerous other things. He was big on helping others who came to him with a need when he was able to help, and many can attest to this side of him. On many occasions over the years he never hesitated to open his home or provide a couch to someone who needed a place to stay or provide monetary assistance to a person in need. When he was physically unable to travel long distance, he made a point to call family and friends all over, just to catch up and stay connected. You’d often find him on the phone with his big sister, Vivian, Rev. James Vickers, and countless others, where they would be lost in conversation. He enjoyed the relationship, the connection. Preceding him death are his parents, Roy and Rosa Cook; daughter, Cantrell Cook; and sisters, Miriam Cook and Deborah Cook. Left to cherish his memory and carry on his legacy, his wife of 41 years, Belinda, of Sarasota, FL; a daughter: Nakeisha Cook, of Sarasota, FL; a son: James Cook, Jr., of Sarasota, FL; grandchildren: Maurice Cook, Jamari Cook, Talasisa Cook, all of Sarasota, FL; Bryce Fulmer, of FL; Johnathon Cook, of FL; three sisters: Vivian McDonald, of Lorton, VA; Darlene Cook, of South Daytona Beach, FL; and Valerie (Ricky) Rhodes, of Sylvania, GA; two brothers: Wayne Cook, of Seville, FL and Stanley Cook, of Crescent City, FL; mother-in-law, Minnie Brown, of Sarasota, FL; father-in-law, Clarence Fulton, of Crescent City, FL; sister-in-law, Eyris (Robert) Brown, of Philadelphia, PA; God-son, Aaron Lewis, Philadelphia, PA; and a host of aunts, uncles, cousins, nieces, nephews, and numerous friends. 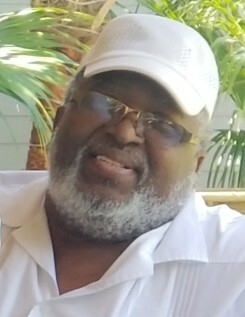 Visitation will be held 6-8pm Friday, April 5, 2019 at 720 Manatee Avenue West Bradenton, Florida 34205 under the direction of Apostle I Funeral Home with Homegoing Celebration 2pm Saturday, April 6, 2019 at Happy Gospel Church 1915 53rd Avenue East Bradenton, Florida. Burial will take place 10 am Monday, April 8, 2019 at Sarasota National Cemetery Sarasota, Florida.